Chris Shepherd, Lecturer in Animation at Middlesex University, is working with Dr Emma Parker of the University of Leicester on a new animated film and comedy project as a tribute to the late playwright Joe Orton on the 50th anniversary of his death. 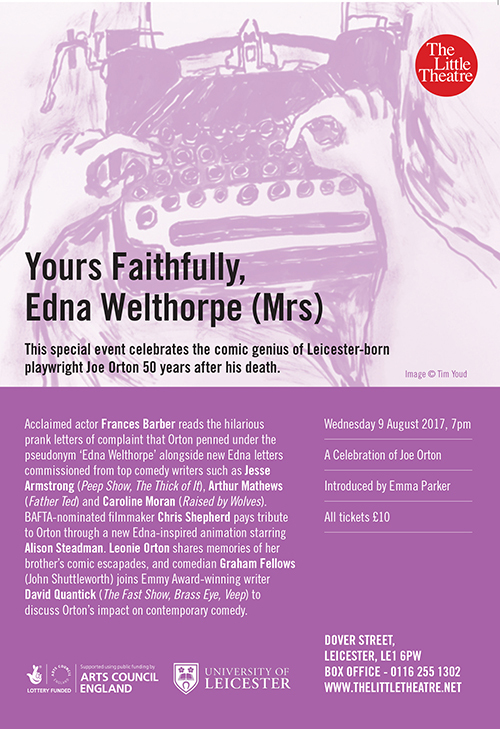 Yours Faithfully, Edna Welthorpe (Mrs) is based on prank letters of complaint written by Orton to various companies and institutions. The project includes new letters written in Orton’s style by writers including Jesse Armstrong (Peep Show, The Thick of It), Arthur Mathews (Father Ted) and Caroline Moran (Raised by Wolves). The animated film – directed by Chris Shepherd – is inspired by the Edna Welthorpe letters and stars Alison Steadman. The project—funded by Arts Council England—will be launched with a special event at The Little Theatre in Leicester on 9 August, the anniversary of Orton’s death. The Little Theatre is where Orton began his career in theatre as an actor. Orton’s sister, Leonie Orton Barnett, will attend the event to share memories of her brother’s comic escapades. Comedian Graham Fellows and writer David Quantick will lead a discussion on Orton’s impact on contemporary comedy. Chris is proud to be closely involved in this testament to such a well-respected writer. “It’s such an honour to be celebrating the life of Joe Orton - one of the greatest British playwrights and my comedy hero,” he says. Chris’ recent film Johnno’s Dead won Best British Film at the London International Animation Festival 2017. His short film Dad’s Dead won over 20 international awards and was nominated for a BAFTA. He has also worked on several TV shows including Nathan Barley and the BBC’s Big Train. Chris Shepherd and Emma Parker will also be joined by Robin Ince for a discussion of Joe Orton’s work at the Latitude Festival on 16 July 2017.